The Pembroke Hamilton Club [PHC] Foundation held their Sixth Annual Awards Ceremony recently and over $26,000 in scholarship funds was handed out to six students. Aden Peets is studying music at the University of Salford in the UK and received $5,600.00. He plays in the PHC Majorette Drum Corps. Sudan Furbert, who has played on the PHC women’s football team, is attending the University of Exeter in September with plans to study psychology and has received $5,000. Also collecting $5,000.00 was Kali Lespere who attends Episcopal High School in Virginia. Ms Lespere was absent at the ceremony as she is currently in Puerto Rico as captain of Bermuda’s U17 women’s team taking part in the CFU FIFA World Cup Qualifying Tournament. Treaz Place, who has been involved with PHC programs since the age of four, received $5,000 to help with his studies at St. Mary’s University. Jaeda Smith has been involved in the PHC girls soccer program and played for Bermuda’s U17 women’s team. Ms Smith collected $3,000 as she attends Montverde Academy Preparatory School with plans to study criminology. Casey Castle is attending the University of Indianapolis and received $3,000. He is studying marketing and has been involved with PHC programs all his life. Opposition Leader Marc Bean congratulated the Foundation on continuing to support their community and encouraged and challenged the students to not only accomplish their goals of graduating, but to return and give back to the Bermuda community. PHC Club President Chris Furbert addressed the students and thanked the foundation which was established in 2008 for giving out over $100,000 in scholarship funds to students over the past years. Keep up the good work PHC! Well done PHC! Much success to all of the awardees. Congratulations! I am happy for all the scholarship recipients and thanks to PHC for providing them. Thank you to the PHC Foundation for investing into our community and the future of these our young people. Congratulations to all of the recipients, we are very proud of you. Congratulations to all winners, make sure and do Bermuda proud. Not just pass but get As and Bs. 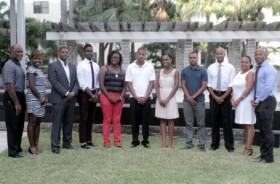 To PHC, what happen to Bermuda College, no award winners for BC? Bermuda we must invest in our local college also as it is a great start for many students who cannot afford to go abroad. Obviously no applicants for BDA college maybe? The PHC foundation has and will support any BDA College attendee. Great job to all of you.